TRICK OR TREAT! Are you getting ready for Halloween? 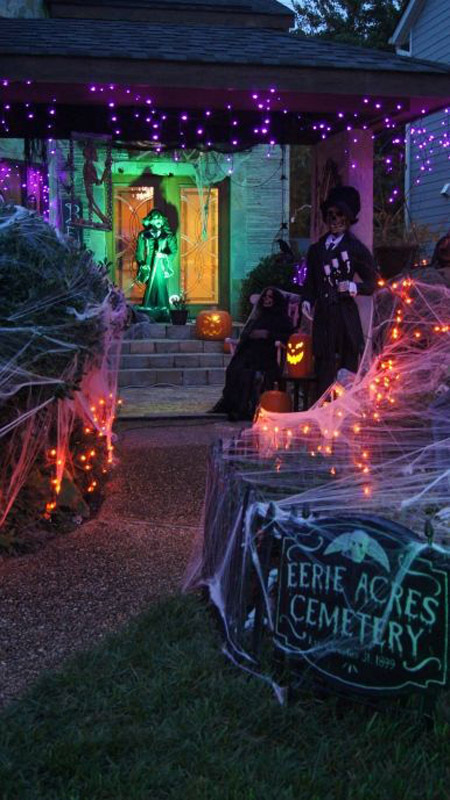 Here are some Halloween decoration photos that would surely give you an idea on how to prepare and decorate inside and outside your house on Halloween. I was browsing through Pinterest and these pins really caught my attention, not only mine but also the attention of many because these photos are having the most repins when it comes to Halloween decorations. So I decided to pick them out for you and share how scary and wonderful these pins are, not to mention how easy and affordable these are to make. By doing this, imaginations and creativity will really come out to make the designs look more horrifying and realistic. 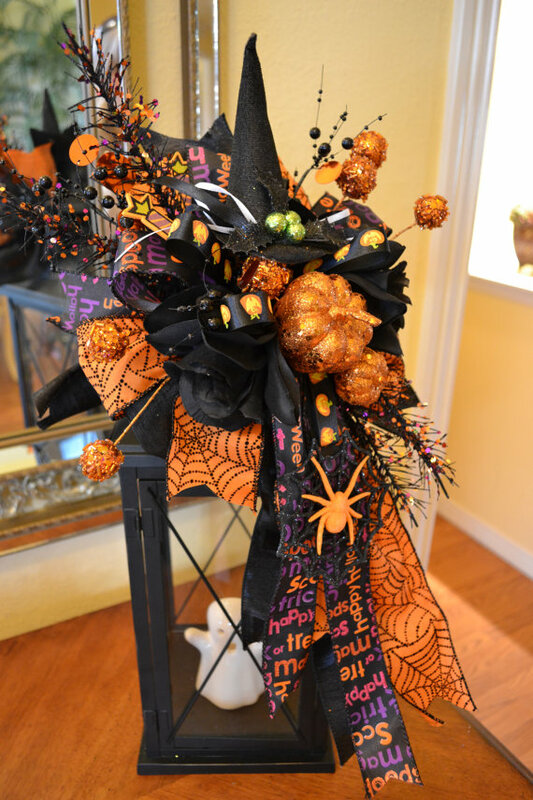 Not only will it make your house look good on Halloween, but it can also be an attraction for those who pass by your house or wherever you may have placed your decoration. Now get ready for you are going to see the scariest things on Halloween! Bats are scary aren’t they? But there are ways on how to turn these scary creepy-looking bats into a very cool decoration that everyone would love to see! No wonder it has been repined thousands of times. Oh yes! A whopping 21,239 repins and counting! It’s very affordable and easy to make that even a child can do it! 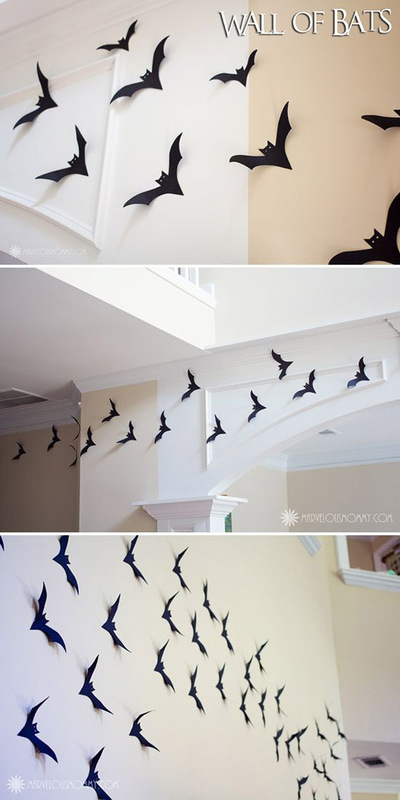 You can make as many bats as you want and place them on the walls and ceiling of your house for a greater effect. Of course everyone is afraid of ghosts! 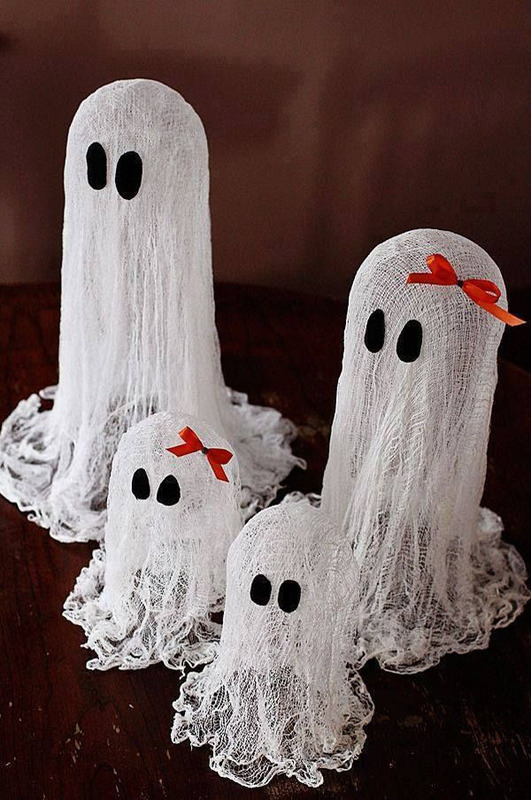 But what if these ghosts would turn your house into a cool one and will serve as a decoration this Halloween? As this image shows, you can see that even a cheap material can be used in a unique way to produce a scary ghost. 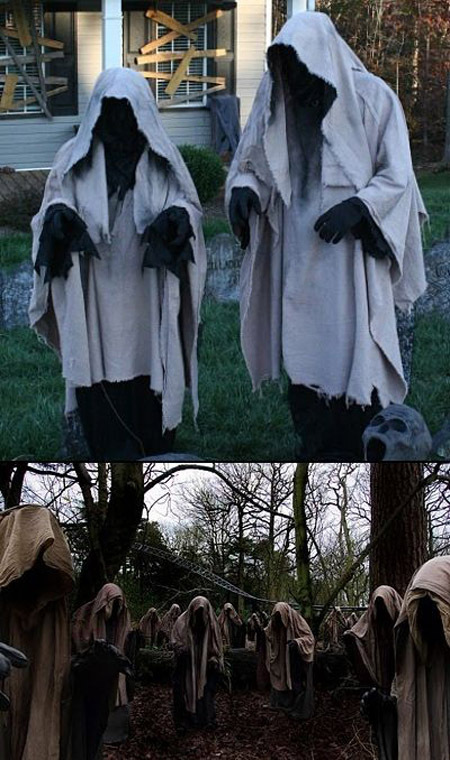 Well even I would love to take a picture with these ghosts! Maybe that’s why it has been pinned by our Pinterest folks 2479 times! They love to have pictures of these too! Uh oh! 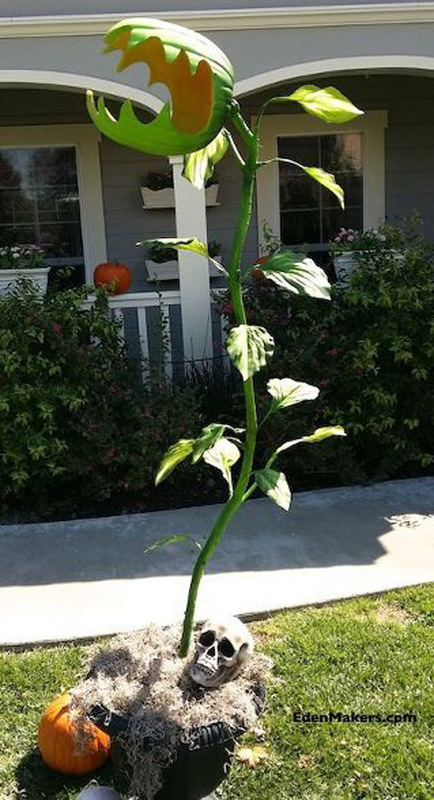 Here comes the flesh-eating monster plant waiting for its next victim. It’s only rare to find these kind of things since it is a little complicated to make and would take some time to finish, so kudos to those who have already made it! This really caught my attention as making this would require patience and resourcefulness. Well, not just my attention but the other 4403 Pinterest user’s interest too! This is one of the creepiest things I’ve ever seen! I even thought this is real and not just some decoration on Halloween. 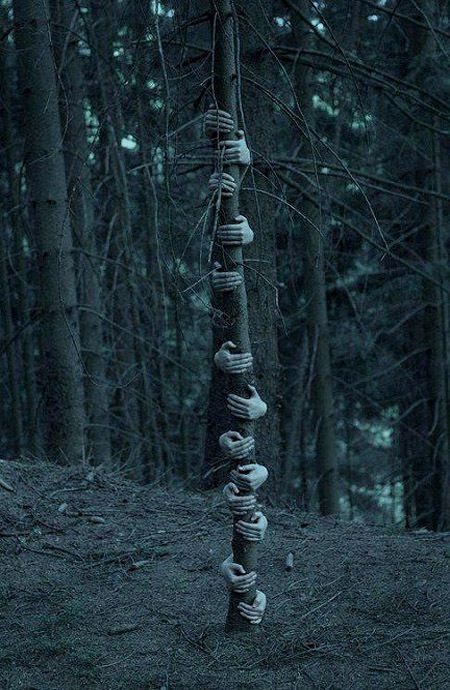 Well who wouldn’t be scared if you’re going to see this at the middle of the night into the woods, right? That’s probably the reason why it has reached around 1558 repins. This can be a good scare for the people around and seeing this would really make my friends freak out, so I got interested on how to do this. For a nerve-racking effect, you can add chains that would connect the hands with each other and change some of the hands into open palms as if they are trying to reach for you but can’t get out. SPIDER ALERT! Spiders live in the oldest places that are full of dust and build their own home using their webs. 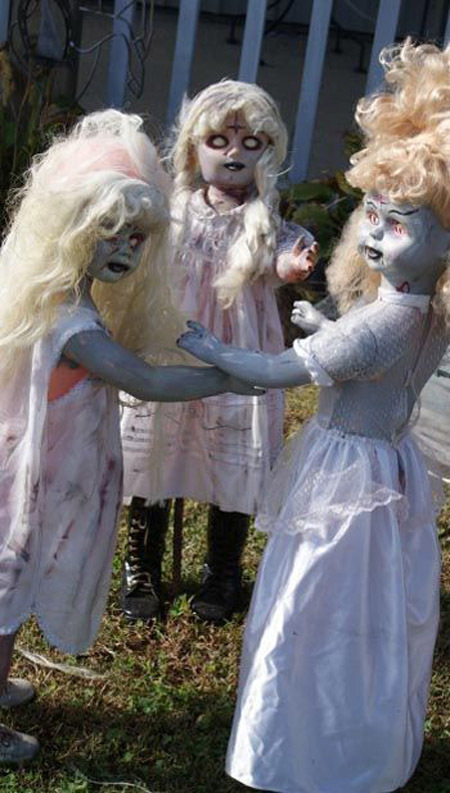 These creepy-crawling things are commonly seen during Halloween as a decoration to scare people. That’s why it is so popular amongst Pinterest folks, gaining more than 12,800 repins! If you are going to see a house full of spiders, are you going inside? Of course not! 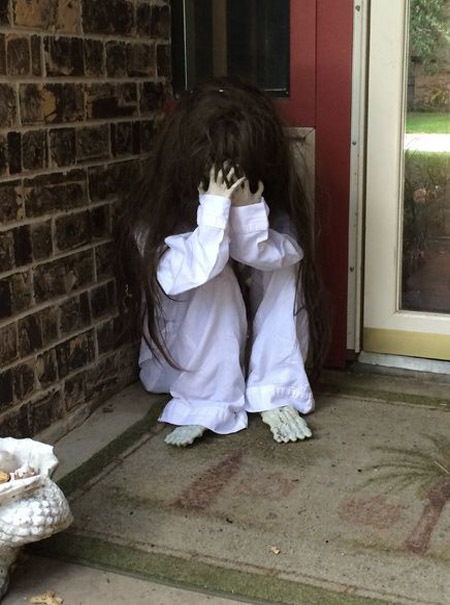 This is a great way to decorate your front door so people who visit your house will be freaked out and would really feel the presence of Halloween. Love seeing yourself in a mirror? Well take a look at this! 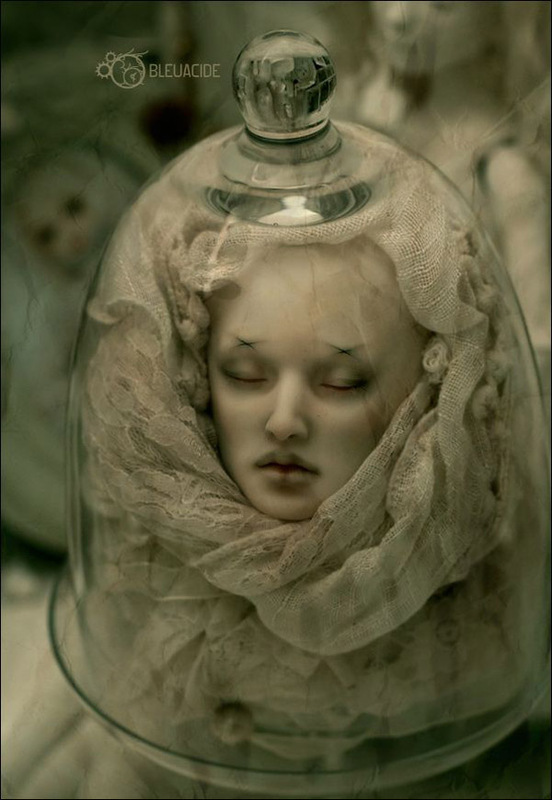 Corpses really are scary as this would somehow signify death, which is why it is very popular during Halloween. I really love this decoration because it is kind of scary but at the same time very classy. 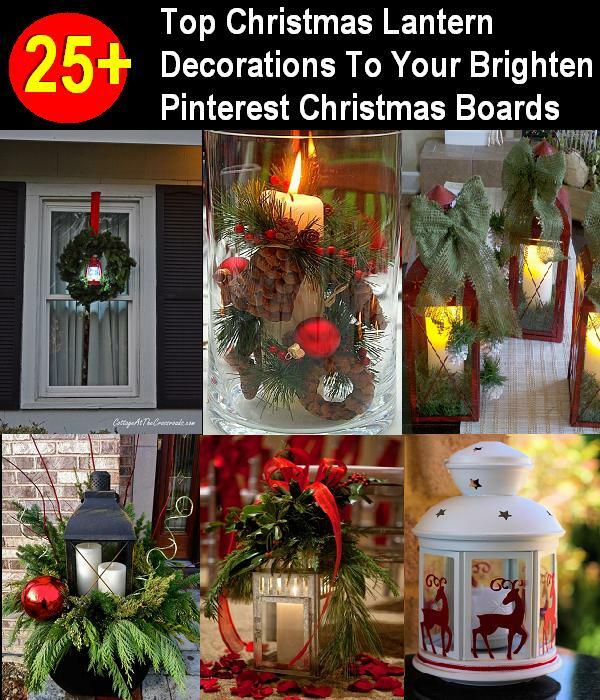 Other 4392 Pinterest users love this one too! Now here’s a terrifying house! It looks like an abandoned house that anyone who’s inside can never go out, plus a scary-looking pumpkin that guards the house. If I would be walking down these streets at the middle of the night, I’d definitely notice this one as it gives a thrilling effect to those who pass by. Some Pinterest folks would love to have this too, that’s why it gained around 1107 repins, and counting! 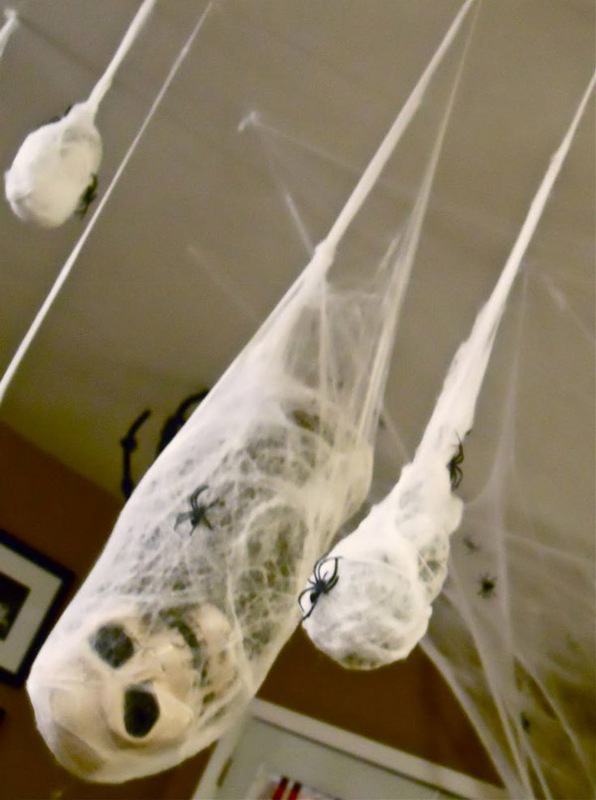 To make it more realistic, you can add spider webs, dusts, and maybe some black water-based paint on the walls so it would look like an old burnt house. Kids love those cookies in a jar, but what’s popular during Halloween are “skulls in a jar!” I really love this one as it is very easy to make yet a great design to display in your house. Also, the materials used can be seen anywhere and are not that rare, so it is very easy to find especially during Halloween. It’s so simple and easy that it has been repinned for more than 1500 times! 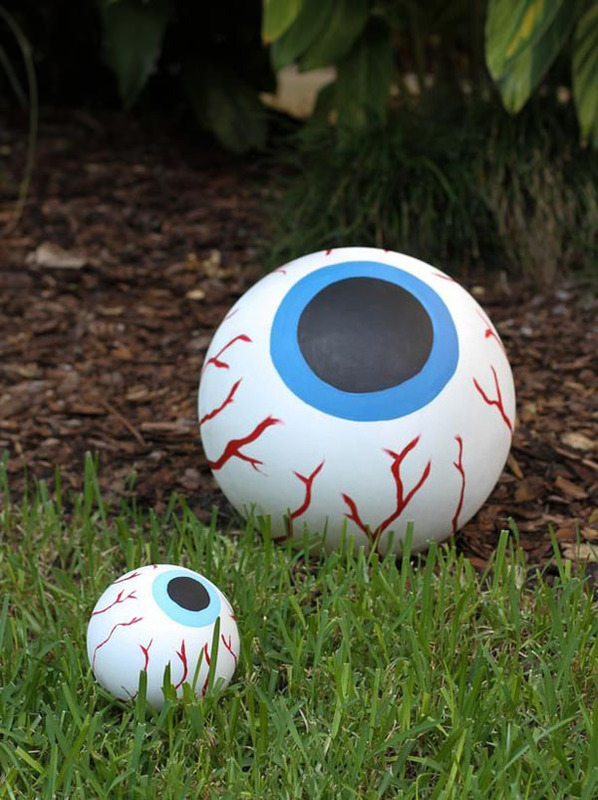 This is a really cute and funny one yet also creepy to display on your balcony during Halloween. 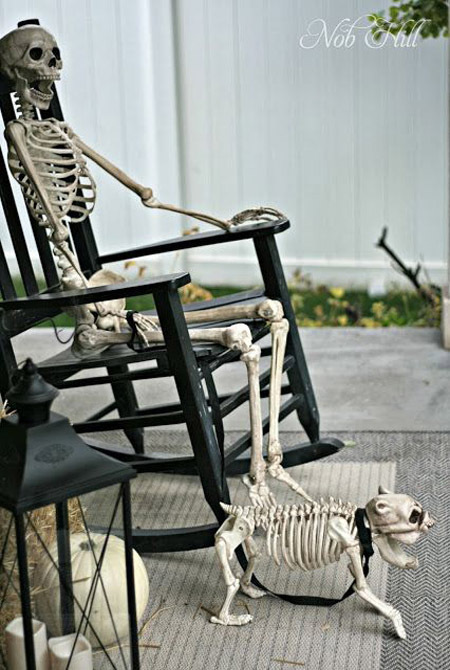 We all know that human skeletons are very popular at this time, but look at the dog and you’ll realize it’s only rare to find a dog skeleton. It’s a unique way to decorate your balcony as if they are the ones guarding your house. You can create dog skeletons as many as you want and you can add a candle beside the human skeleton to give a thrilling effect at night. That’s prolly the reason why it has hundreds of repins – 721 repins to be exact at this moment. This one has caught mine and 1959 Pinner’s attention. The phrase “I have my eyes on you” literally describes this image. If you’re strolling around and you would feel someone is watching you, wouldn’t you be freaked out? I was really amazed seeing this and made me wonder on how to do it. As an addition to what you see in this photo, you can make more of those with different sizes and scatter it into ground to have a creepier effect. Make sure that the eyeballs are pointing to different directions so you can have eyes in every angle. This one looks very real! It’s really amazing to see the effect of a picture and a jar would create, simple isn’t it? By doing this, you can scare or prank your friends especially on Halloween since it is very easy to hide and it can be mistakenly identified as a food. Just imagine on how surprised your friends will be if they are going to see a human head along with your stock of food! if you want a more shocking photo, you can replace it with a scarier one, like the ones that you see in movies or social media, and edit the photo for a proper effect. Well this is really creepy! When I saw it appeared in my computer screen, it freaked me out! No doubt this one had many repins on pinterest. Its theme is like a vintage one since it looks kind of old, maybe that is why it caught the attention of many. 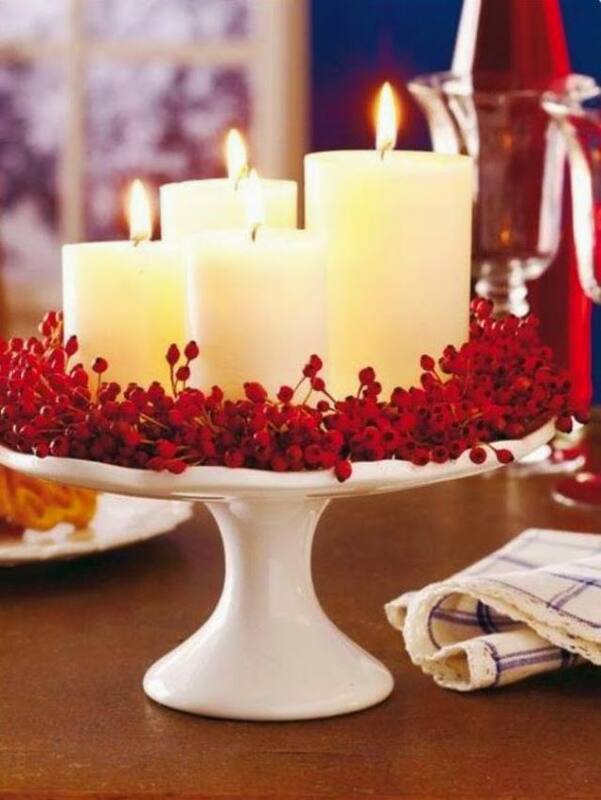 This can serve as a great decoration on Halloween and you can place it in your living room, or if you made many of those you can place it in different parts of your house. If you want a scarier one, you can make one with its eyes open as if it is looking directly at you. Ever heard of skulls that hang on the ceiling? Well here’s one! 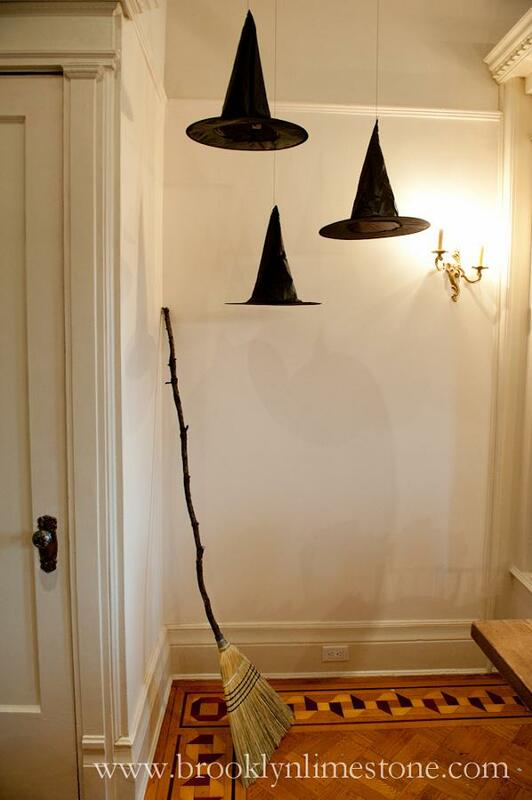 Making this would require patience and hard work since you have to reach the ceiling of your house in order to make it as you decoration for Halloween. With this, you can really feel the presence of Halloween even if you’re inside your house. If you want, you can also add hair in the skulls head as it hangs upside down on your ceiling to make it look a lot creepier. Have you watched suspense movies that always deliver messages through writing with blood? Now that’s one of the scariest parts of the movie! 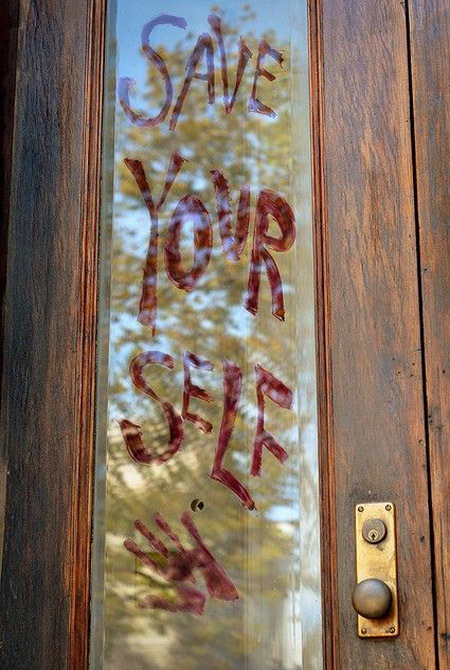 With this, you can now witness and feel a true horror if you’re going to see this on one of the houses along the street. It’s very simple to make but would definitely give a nerve-racking feeling to those who see it. No wonder it garnered around 2,000 repins! 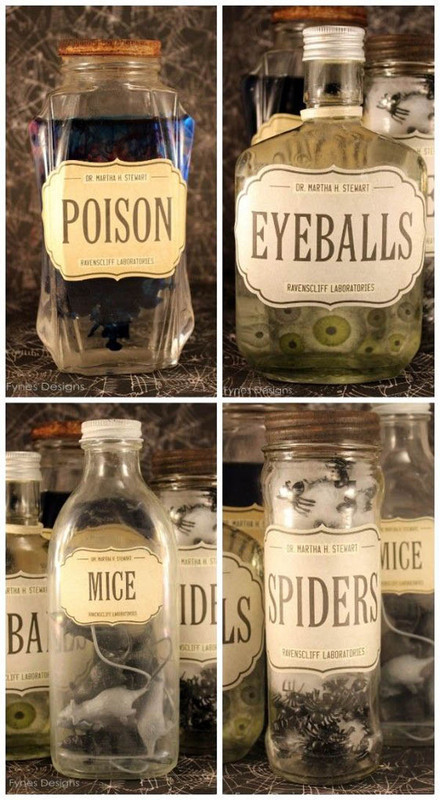 Mice, spider, eyeballs, and everything nice, add a pinch of poison and that would make a perfect recipe for Halloween! It’s like what you see in Harry Potter movies, only this time you get to make and see them in reality. 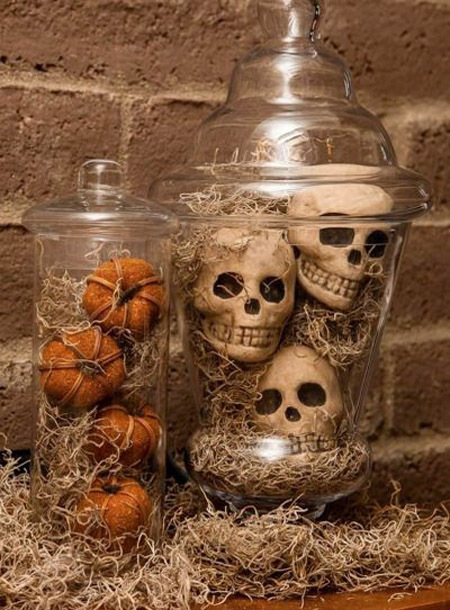 You can display these jars in your kitchen as if they are ingredients for your Halloween killer specialty. If you want to make more of these, you can add other gross stuffs, like fake teeth, fake blood, in jars and display it along with the ones that you’ve already made. This is a perfect package of decoration for Halloween! If you’re going to visit this house, it looks like some vampire lives in it. It’s really a scary one and it can already be identified as a horror house. It does not only focus on one display but it shows the theme or the whole design for Halloween, that’s why many have noticed it. For a creepier effect, you can add some glass wines with red wine in it and some fake bats and spiders on the walls and ceiling. If you’ll look at this photo at first glance you would think that it’s just an ordinary scary one, but if you’ll look at it a little bit longer you’ll notice something creepy. What you’re going to feel is as if someone is staring back at you, that’s why I really like this one. 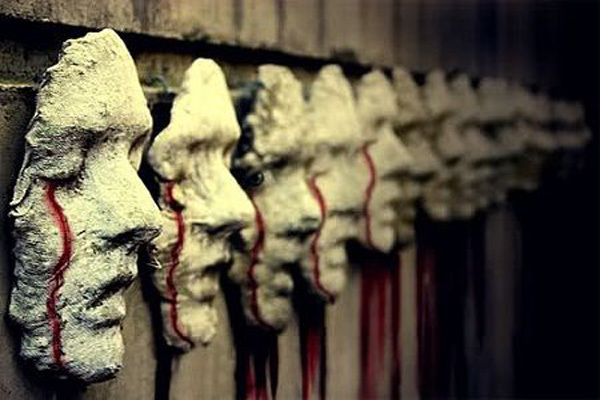 It really gives me the chills, plus the fact that there is blood dripping from the masks eyes. You can also try different facial expressions that you can make and who knows, you might create the scariest mask ever made! Cults do exist in some areas around us, but if you’re going to see something like this you’ll definitely be scared. If I were to see group of people dressed like these I’ll surely scream and run away from them! It’s a very simple one but its simplicity makes it more interesting and scarier, plus the curiosity it gives since the faces of these figures can’t be seen. We can add hand cuffs to their hands or let them hold fake knives to look like they are trying to kill someone. Now who wants to play hide and seek? I got the perfect playmate for you! Little girls with long black hair covering their faces are really scary, just like what we see in some movies. Now on this photo it gives a creepier effect because the little girl is just sitting in the corner while covering her face with her hands. If you’re going to look at it in one glance you might think it is real because it really has the figure of a little girl. To make it more interesting, you can add some fake blood around the floor and on the hands and feet of the doll. This image is kinda hilarious and scary. The idea is very great and you might think that it is hard to create, but the truth is it is very easy and not that time-consuming. I like this one because it depicts the resourcefulness of the person who has made it and his imagination in getting it done. 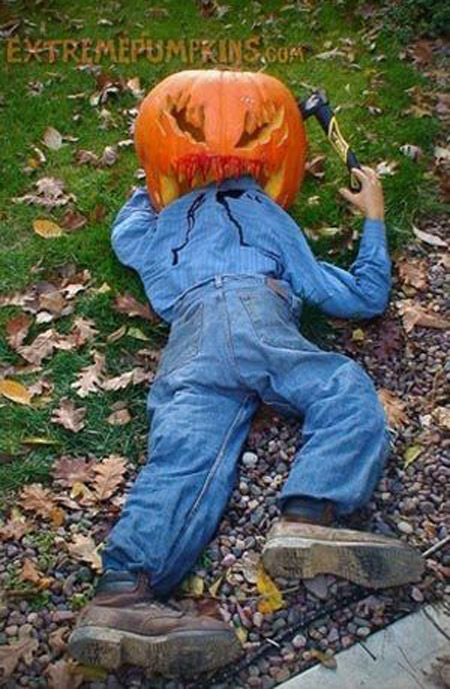 To make it more realistic we could use some more fake blood and use an old and ripped polo and pants to make it look like it had struggle fighting the carnivorous pumpkin. This one is very noticeable since you might be fooled by the image shown at the door. If you’re going to look at it you might think that what you can see is what’s really inside the house, but you’re wrong. 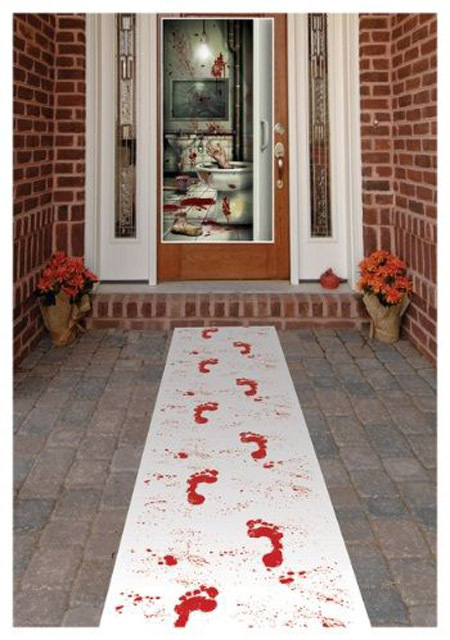 Also the bloody footsteps leading to the door matches with what you thought what’s inside the house, which is a very brutal one that is perfect for Halloween. To have a perfect package, we can remove the flowers beside the hallway and replace it with statues or dolls holding knives and deadly weapons. 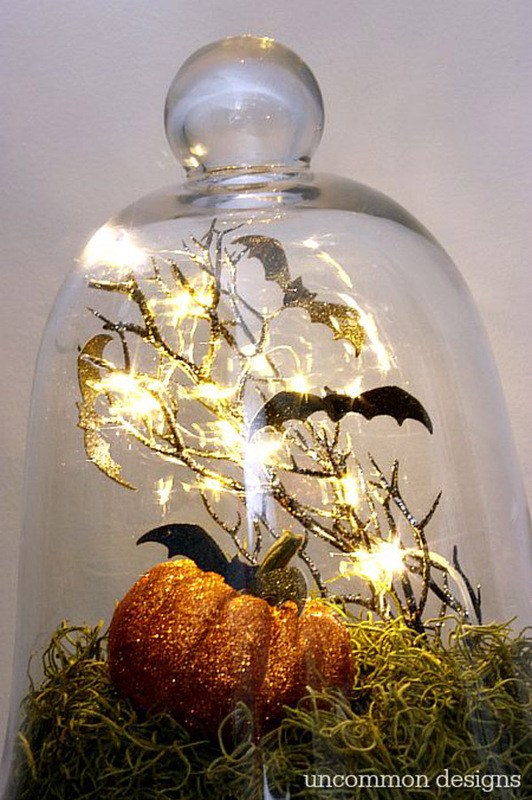 This is one of the prettiest decorations that I have seen for Halloween. It is neither scary nor terrifying but rather adorable and at the same time it still has the theme and nature of Halloween. It is somehow magical and enchanting that will really catch the attention of the people that pass by. 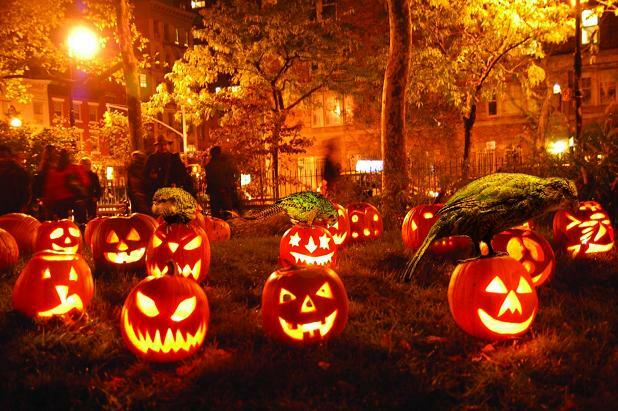 As for this, we can add some little pumpkins that are smaller than the one shown in the picture and some white stones on the ground. 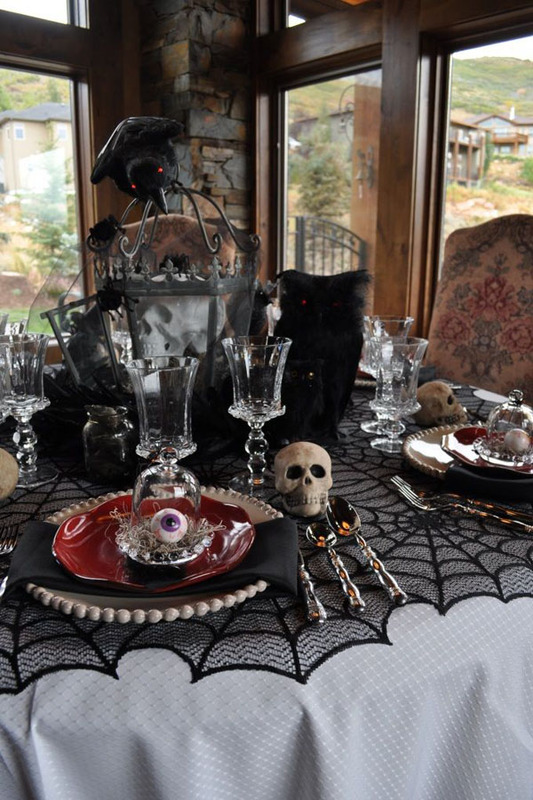 This is an example of a perfect feast in the table for Halloween! 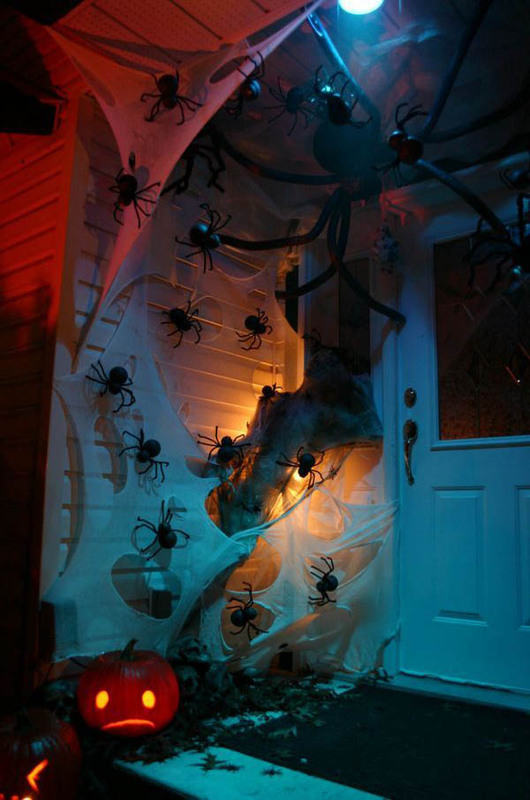 Its design and arrangement is really for Halloween and it has a complete set-up that would really match the season. 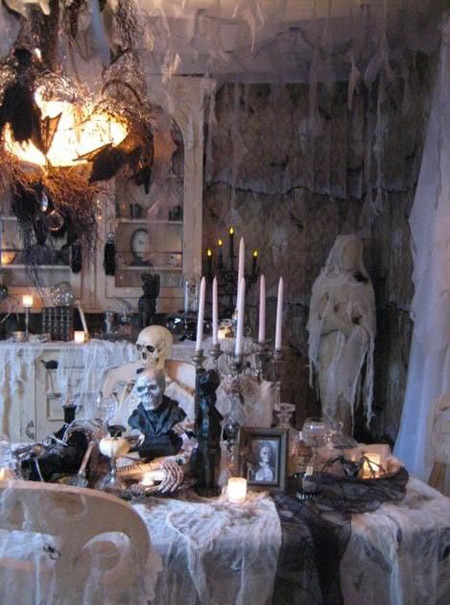 From table cloth up to the skull decorations, all of it really goes well with each other and compliments everything that is in the photo. For some minor details, maybe we can place some tiny candles or glow stick inside the skulls so it can be more emphasized at night. 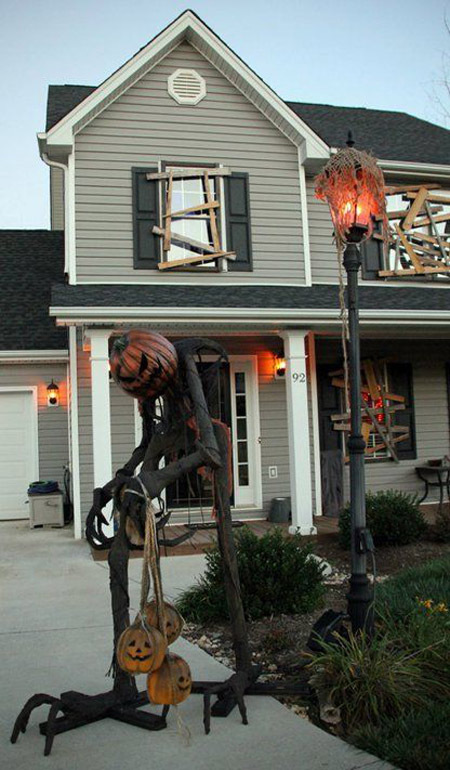 Now this is a full effort in making a horror house! As you can see it’s not that easy and it requires hard work because it does not only focus on one decoration, but the theme and design of the house as a whole. It is somehow time consuming but after all of it, it is really worth the effort. If I’m going to pass by this house, I’d definitely be eager to look inside and discover scarier stuffs that they may have. An addition, we can have some tombstone with “R.I.P” on it to give a hair-rising effect on people who sees it.